There’s been a recent shift in Fine Art photography with African subject matter; instead of being wholly photos OF Africa by outside professionals, photographers FROM Africa have finally gotten their due. 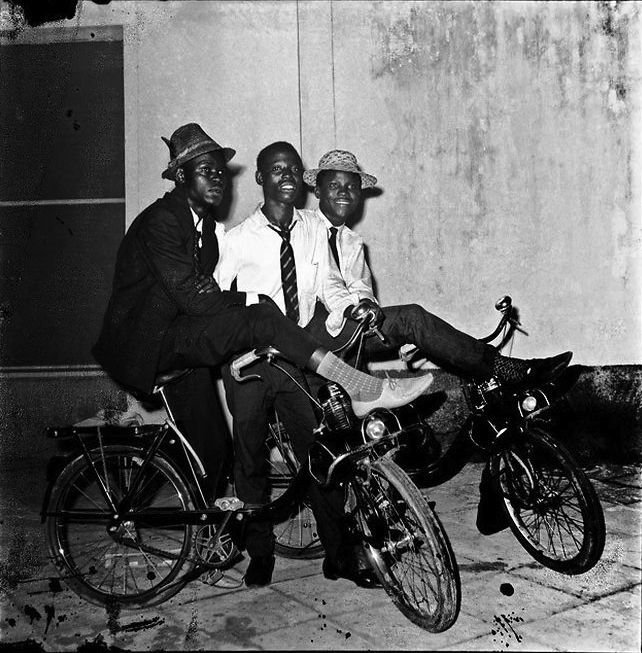 The most famous of these is Malick Sidibé, who worked in Mali from the 1960s onwards, documenting street life and capturing the fashions and moods of Mali in his portrait studio (Studio Malick). 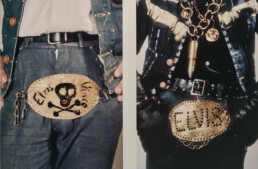 Included in his many portraits are a few props from his subject’s lives, which often meant small motorcycles and mopeds, with sharp-suited young men or whole families draped over their hard-earned mounts. A portrait of a BMW R26 rider, with a shadowy self-portrait! 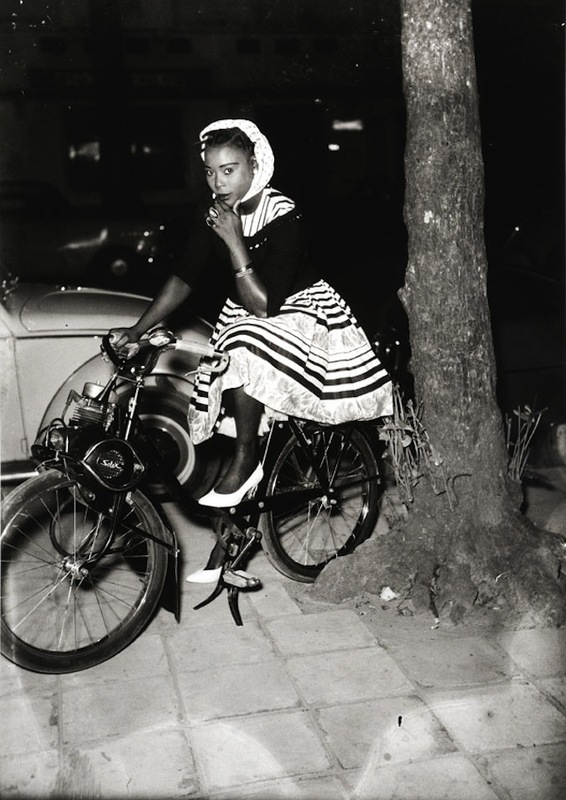 Congolese photographer Jean Depara (1928-97) had his first full retrospective at Maison Revue Noir in Paris, in 2012. 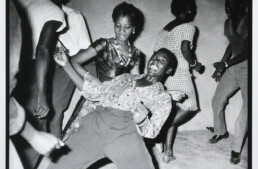 Depara’s ouevre is similar to Sidibé, although his ‘Jean Whiskey Depara’ photo studio shots were less interesting than photographs of the world he preferred to inhabit; the happening nightclubs and bars of Leopoldville (later, Kinshasa). Depara bought a camera (an Adox 6cmx6cm) in 1950 to document his wedding, but he became enthralled with image-making, and the interaction of photographer and subject. Three ‘sapeurs’ in snazzy outfits with their mopeds. 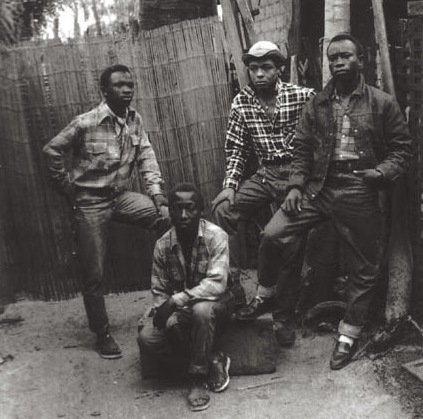 A Congolese Rat Pack! Cowboy style…the gent on the right could have been captured in Brooklyn today! Depara was in the thick of a cultural explosion in the mid-60s, as the country experienced an exhilarating wave of energy after independence. 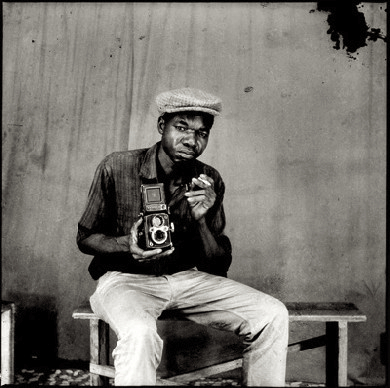 Kinshasa was musically the heart of Africa in the 60s, and Depara spent much of his time around the hot bands and night clubs, where his talents were noted by the famous musician Franco (Francois Makiadi Luambo), who needed an official photographer. This suited Depara, who by this time had honed his technique with the camera as an image-maker, and as a tool for seduction of women! 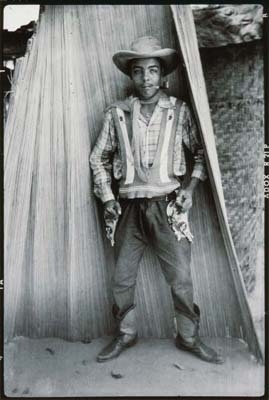 Jean Depara captured an era of curious integration of American culture as well, as local sapeurs (sharp dressers) sometimes wore cowboy outfits – the ‘Bills’ – and these make an interesting contrast with the work of Swiss photographer Karlheinz Weinberger and his ‘Halbstarke’. Mods and cowboys, women in (or out of) gorgeous dresses, Vespas and mopeds, Depara gives us a glimpse of a very hip world we in ‘the rest of the world’ didn’t have a clue existed. In the mid-1970s, as revolutions, coups, and communist takeovers swept Africa, Depara was offered a secure position as official photographer of the Congolese parliament, which he held until retirement in 1989. Uninterested in color photography, and due to the declining profitability of his genre, Depara hung up his camera afterwards, and lived a comfortable existence with his ‘villa and a convertible’. 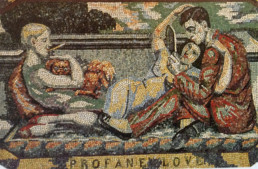 His work was published outside Congo only after his death in 1996, and is now appreciated by a global audience. 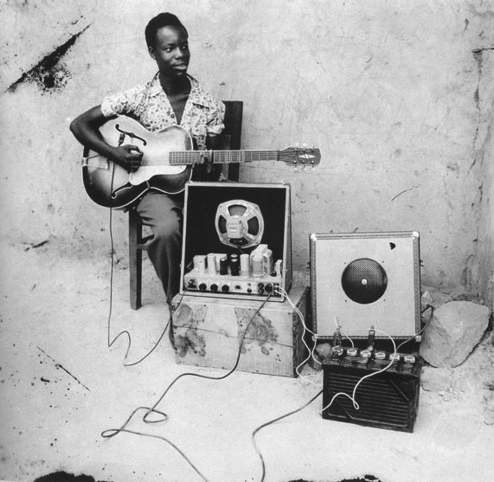 The origin of the amazing Congolese electric guitar sound – Congotronix! There is a book “King Leopold’s Ghost” by Adam Hochschild that tells in graphic detail of Leopolds nasty ways. 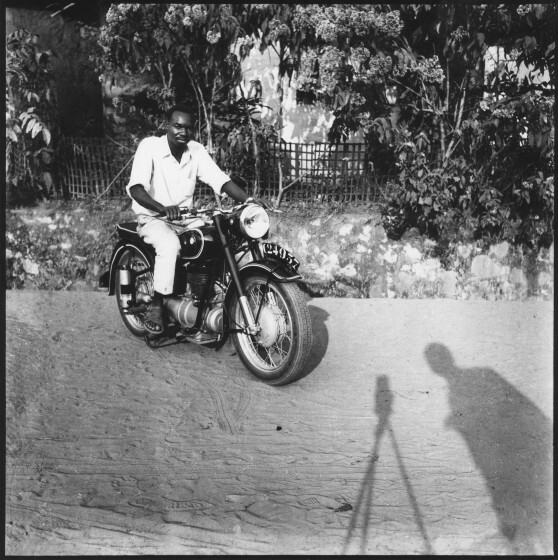 I would highly recommend the photographic, coffee table-style books of Malick Sidibe (available through Amazon Books, etc.). When my family lived in Bamako we met this man – unknown, humble, gracious and happy. Most Africans, no matter how poor, are this way. They tend to display a contagious happiness regardless of their circumstances. A good lesson to us all. And West Africans, particularly Malians, have for centuries been at the forefront of art, whether it be primitive, traditional or modern. Per the Congo, I will say that there was one grand deed done by the Belgians: Leopold’s grandson, King Albert, by persuasion of American Carl Akeley, established Africa’s first national park. Thanks for this. More things I knew nothing of. The book ‘Red Tape and White Knuckles’ by Lois Price portrays a very different view of that area as it exists now.